Indian captain Mahendra Singh Dhoni on Saturday said the fireworks would only be limited to on-field action, promising that his side would ensure a controversy-free India-Australia series without compromising on the intensity. Australian opener David Warner foresees Indian cricketers struggling to adapt to conditions during the upcoming Test series and feels the longer they are kept out on the field, "the harder it will be for them mentally." The opening match of the Liberals Hockey tournament being played at the PPS Grounds here between J&K Police and North West Institute of Engineering Dhudike started on a sedate note with both teams adopting a cautious approach resulting in defensive tactics. The people of Punjab are known for being brave-hearted and their willingness to do everything daring that the others would hesitate to attempt. This was proved in the action today at the 3rd JK Tyre-0YA Motocross and Autocross 2011, which saw heart-stopping action from the top rally drivers of the country. Mumbai pipped Punjab by nine wickets here today on the fourth and final day of their concluding Ranji Trophy Elite Division league tie to rocket to the top of Group A with 25 points. In a bid to take the game of golf to the masses a couple of dedicated golf professionals from Chandigarh have made a foray into the interior of Punjab and set up a golf academy at the DPS School in Khanna and the move has attracted a lot of young players who have been drawn to the game. Delhi’s Honey Baisoya ensured it wouldn’t be an all-Bangalore final as he beat Khalin Joshi in the semi-finals of the Goodricke Eastern India Matchplay Golf championships at the Royal Calcutta Golf Club on Saturday. Having done all the hard work with spectacular results, Indian players would look to hold their nerves in the final dash to finish at the podium in the World Women Chess Team Championships here. "Individuals do make mistakes. But as a professional cricketer, you don't want it. There is a lot at stake, people look up to you, so you want it controversy-free. Still, it's important you make it interesting," said Dhoni referring to the 2008 series when ugly exchanges between the two sides almost led to the tour being abandoned midway. All hell had broken loose during the second Test at Sydney when India was at the receiving end of a few controversial decisions, capped by the "Monkeygate scandal" which dragged a few players of the two teams into the chambers of a court. Dhoni said injury-prone pacers Zaheer Khan and Ishant Sharma are expected to be fit for the first Test against Australia and precautions have been taken to ensure that they don't break down in the middle of the series. "We've missed Zaheer quite a few times in the past. 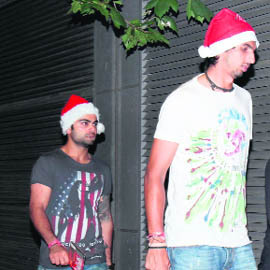 We did give them (Zaheer and Ishant) some time off, they bowled in the practice game as well as in the practice session. They are shaping up well. There are two more days and we know a lot can happen in two days. Hopefully, they would all be available for selection," Dhoni said at the pre-match press conference. "We've tried to take as much precaution as we could (regarding Zaheer and Ishant). We've tried our best whatever we could do. Players have also played their part, they worked outside the field also, in the gym and the rehab sessions they needed to do. They have put in a lot of effort in practice. Hopefully, they wouldn't have any injury. "Everyone's fit for the game. All players are looking fit which you need for the format of the game. 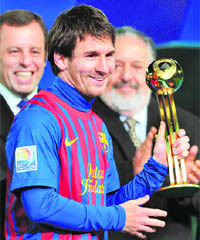 We don't need to be worried (on fitness count)," he added. Dhoni also hoped the tour would be different in respect that India has never prepared as well as they have for the present tour. "We've taken care of the preparation --- if 12-14 days are not enough then even one month wouldn't be enough. We've worked and looked at preparation from all angles so that once we are on the field, we can play by instinct and not worry about other factors. "Our batters have toured here in the past. They know these conditions well. The first practice wicket (in Canberra) was very different, a bit on the slower side. 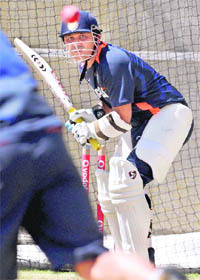 But this one in the nets here has a bit more bounce which is useful," he said. Dhoni is conscious of the fact that everyone expects his team to win the present Test series but he doesn't want to lose sight of the immediate task. "How we start in the first Test is important. We want to be in the moment. Break the match into sessions, try to win more sessions than the opposition team. If we win enough sessions, we will win the Test. Our emphasis would be on small things, not where we want to be at the end of the fourth Test. "There's no point in taking that extra pressure. It will not help us. We need to keep it simple." Dhoni then went on to speak about a few individuals of the side, including Sachin Tendulkar, who everyone expects to get his 100th international century at the MCG. "He (Sachin) keeps it simple. He would get it, sometime in this or the next Test, this or the next series. It is on the way. It isn't something he wouldn't achieve. But if he gets it soon, everyone would feel relieved. "Getting 100 hundreds is something really big. If you ask me, he's played more international cricket than we have even practiced. He also shares a lot with youngsters who are new to the side. Everyone in the world would cherish the moment when he gets his 100," Dhoni said. "You look at their line-up and you can think 'oh how are we going to get these guys out'. But we know when they're in Australia, the wickets are different, and we think their mental approach is a bit different to what it is when they're in India," Warner said. "We think they automatically know they're going to win series in India because the wickets turn and it is all in their favour. And it is probably similar to when they come out here, we think the bouncy wickets, they might not be able to adapt to it," he added. Warner, however, conceded that the quality of India's batting line-up is such that, they are expected to score big no matter what the conditions are like. "They're one of the best line-ups in the world, and capable of scoring big runs on the wickets we're producing here. We've got to be spot on with our lines and lengths with our quicks, and when we're batting we need to put on as many runs as we can...I reckon we're in for a good series," he said. Warner said the key lies in exhausting them on the field. "I definitely think the longer we keep them out there (in the field) the harder it'll be for them, mentally as well," he said. "We know a couple of their players don't like being out in the field for too long and their fast bowlers are under injury clouds as well. "So the more overs we can get out of them, the better for us going into the second innings and also the upcoming Tests. If we can do our damage early in the series it'll hold us in good stead for the following three," Warner added. Talking about his own game, Warner said he has learnt to put a premium on his wicket now. "My mental side of the game has changed massively, sometimes in the past I might've gone out there and just lost my head or just thrown my wicket away," he said. "Now I respect my wicket 100 times more. Even in the nets it is the same thing, I used to just go in there, have a hit and say 'I'm satisfied with that'. As the game progressed the policemen mounted pressure and forced five short corners in quick succession and went into the lead in the 20th minute through inside left Inderpal Singh who scored from close range with a pass from outside right Gurjeet Singh. The collegians hit back and equalized in the 28th minute through Mehtab Singh. After crossing over level 1-1 at half time Jammu team accelerated their attack and went ahead 2-1 in the 42nd minute with Surinder Singh from the left wing. Dhudike once again hit back and quickly equalized 2-2 in 45th minute by Sandeep Singh who collected a neat center from the right flank and scored with a deflection. 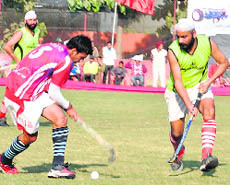 J&K Police cente forward Sartaj Singh was obstructed in the center by Dhudike defender and umpire Divinder Singh had no hesitation in awarding a penalty which was duly converted by Gurdeep Singh to put police men 3-2 ahead. The determined youngsters of North West Institute once again came back strongly and equalised 3-3 in the 52nd minute with a fine goal by Yadwinder Singh who scored a goal from the top of the circle. It was a twin-track affair, designed by national champion Sunny Sidhu, Nikhil and Prince, where two cars could race at a time. Harpreet Bawa, a National rally driver, was adjudged as the champion in the 4X4 category, while Phil Mathou (Delhi), Yogesh Lakhani, Mohit Verma and Vinay Thakur took podium in other categories. The audience was enthralled by the action that continued for around eight hours. According to the Federation of Motorsports, the race had to take place on a flat track, but the organisers boasted of jumps, tunnels and bridges, exhibited for the first time in the northern India. This definitely increased the level of excitement and thrill but added to danger for the drivers as well. The 39-time champions, who already had a first innings lead of 204, shot out the visitors for 330 in their second essay and then surged to the target, making 132 for one with more than 10 out of the 15 mandatory overs to spare at the Wankhede Stadium. The victory for Mumbai also knocked out Punjab from the competition. The hosts, who had booked a berth in the last eight stage even before the start this match, now await the quarterfinal draw to be made on December 26 by the Cricket Board to know their next round opponents. Punjab's goose was as good as cooked when they, needing an outright win to qualify, lost the plot in the first innings itself today. Chasing 127, Mumbai lost opener Kaustubh Pawar (23) early but the second wicket pair of left-handed opener Praful Waghela and captain Wasim Jaffer hit half-centuries each to put up an unbeaten stand of 94 and guide Mumbai home to their third outright win of the season from seven matches, and maiden one at home this season. At the DPS Khanna Golf Academy children demonstrated their golfing skills on Saturday when a putting competition was also held where the winner was young Gurnoor Gill. According to Mrs Anu Bains, vice-chairman DPS Khanna, "the school will become a nursery of golf in interior Punjab. DPS Khanna provides and ideal opportunity to pick budding golf talent and nurture it." The nine-hole junior golf course at this school has been designed by Arjuna Awardee and Asian Tour Winner Harmeet Kahlon. According to Harmeet, who is Golf Advisor of DPS Khanna, "the Bermuda Grass greens have been designed and constructed as per USGA standards. The school has a golf course within the compound with five big greens, tees and a driving range. The DPS Khanna Golf Academy is up and running with certified coaches. Golf is taught daily as a part of the curriculum. Golf camps are being held regularly. Over 200 school children have been learning to play golf under Chandigarh Golf Club Joint Director, Manjit Kochar, USA and Canada certified coach." Prominent golfers from the northern region like Jeev Milkha Singh, Gagandeep Bhullar, Harmeet Kahlon, Arjun Atwal, Jyoti Randhawa have won laurels in this game for the country and themselves. Among the women Irina Brar, Parneet Grewal and others have clearly demonstrated that girls from this region can do well in this sport as well. DPS Khanna is a co-ed school and hopes to produce good golfers both among the boys and girls. Baisoya, who has had a decent season, beat Joshi 2&1 and will take on the National champion, Seenappa Chikkrangappa in the final. Chikka beat Angad Cheema 3&1 in the other semi-final. Both semi-finals last 17 holes each. The final will be a 36-hole affair with Chikka and Baisoya clashing for the first segment of the final in the morning at 7.30 am and will then continue the battle in the second half with 18 more holes. Semi Final Results: S Chikkrangappa def Angad Cheema - 3&1; Honey Baisoya def Khalin Joshi - 2&1.Final: S.Chikkarangappa v Honey Baisoya - First round at 7.30 am and second round at 11.30 am. Led by Grandmaster Koneru Humpy, the team has fared spectacularly well, winning four and drawing one match in the five rounds played so far. The other members of the team are Dronavalli Harika, Tania Sachdev, Padmini Rout and Soumya Swaminathan. Here, as a last minute entrant due to withdrawal of some teams, there was hardly any time for the Indian players to prepare and in spite of that the results have been astonishing.